TYMCO® today introduced a conventional truck package for the TYMCO Model 435® based on the International® DuraStar® that brings all of the advantages of a conventional truck while maintaining features existing TYMCO owners with cabover trucks expect. This package delivers operator-friendly ergonomics and easy truck engine serviceability as well as excellent maneuverability and visibility. "With the conventional truck package for the Model 435, we can offer improved operator and service technician ergonomics as well as an excellent turning diameter," said Bobby Johnson, TYMCO's Vice President, Marketing. "The DuraStar gives Model 435 owners more choice so they can get exactly what they are looking for in a mid-sized sweeper." The International DuraStar provides easy cab accessibility, excellent front visibility and more space in-cab than most other commercial trucks available in the North American market today. Being a conventional truck, it also provides better engine serviceability by simultaneously allowing access to the cab while the engine compartment is open. Since the inherent design of the DuraStar does not use a vertical exhaust, TYMCO has also increased rear visibility on the passenger side by opening up space behind the rear window. The Conventional Truck Package for the Model 435 offers operator comforts such as adjustable high back air suspension seats, 2-stage cabin air filters, heated power mirrors as well as dual tilt steering wheels, instrument panels and controls. TYMCO also includes an automated pre-trip exterior light check system, cruise control and a 52 gallon fuel tank among others great features. With this package, the Model 435 has a payload of over 8000 lbs, overall sweeping path of 132" and dump reach over 81". This package is available today worldwide through the TYMCO Dealer Network in two configurations – the International DuraStar with the MaxxForce® 7 engine or MaxxForce DT engine, both equipped with 2010 US EPA emissions. For customers in countries other than the United States that require alternative engine emissions, TYMCO can special order a truck with the specified emissions for that country. TYMCO chose the International DuraStar as its preferred truck chassis for this package because of its tight turning radius and shorter overall length with 2010 US EPA emission requirements. TYMCO is committed to continue developing sweepers on trucks that provide the best experience for TYMCO owners, service technicians and operators. TYMCO first introduced the Model 435 over 10 years ago, and our engineering design principles remain the same – build street sweeping performance in a mid-size package. It is built using the high-efficiency, time-tested TYMCO Regenerative Air System that provides unprecedented reliability and an amazingly clean sweep whether you're sweeping bulky leaves and trash or heavy sand and gravel. All of this matched up with a low profile, easy-to-dump and clean 4 yard hopper, and you have the most versatile mid-sized sweeper available. TYMCO modernized street sweeping in the 1960s with the invention of the Regenerative Air System and Model 600, reinvented parking lot sweeping in the 1970s with the Model 210 and delivered high speed Foreign Object Debris (FOD) removal with the Model HSP airport runway sweeper in the 1980s. TYMCO also pioneered environmentally conscious dustless sweeping with its Model DST-6 and Model DST-4, and leads the clean alternative fuels market with Compressed Natural Gas (CNG) powered sweepers. 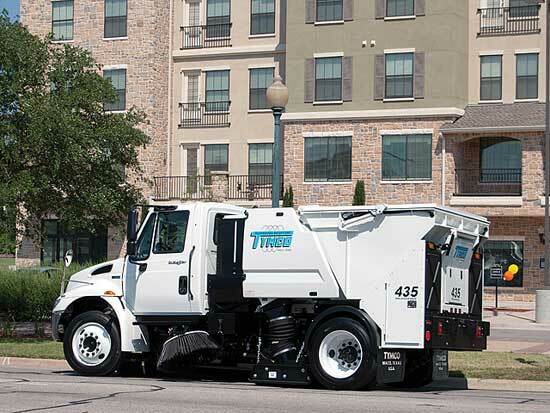 Today, TYMCO continues its dedication to the Regenerative Air System by driving innovation with the highly maneuverable Model 435 and high dump Model 500x street sweepers, and has recently introduced the hDrive Power System for the Model 210h parking lot sweeper which is defining the future of sweeper power systems.